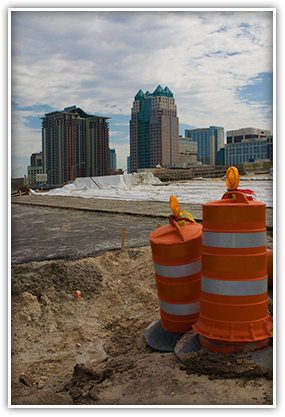 Interested in job opportunities, economic impacts and the people building a better I-4? You’ve come to the right place! Here you’ll learn about our commitment to providing meaningful work opportunities for small, women-owned, minority and local businesses and the steps you need to take to become a part of this historical project. The I-4 Ultimate project has a 9 percent disadvantaged business enterprise (DBE) goal and a 3 percent small business enterprise (SBE) goal for the three distinct project phases: design, construction and operations and maintenance. I-4 Mobility Partners is fully committed to meeting that goal and is dedicated to the promotion of diversity and equal opportunities, fair treatment of all employees, ethical business practices and the safety and health of everyone working on the I-4 Ultimate project. We encourage you to read through the information below to find out more about DBE and SBE prequalification. Firms wishing to do business on an FDOT project must be pre-qualified and satisfy all technical qualification requirements. Firms must be pre-qualified in a specific Type of Work (TOW) prior to commencing project work. A complete contractor qualification form. Audited financial statements within four (4) months of the firm’s fiscal year end. If the most recent year’s annual audited financial statement(s) is not available at that time, the firm must submit its latest available audited financial statement and then submit the most recent year’s annual audited financial statements as soon as they become available, but in no event later than six (6) months of its fiscal year-end. Qualification requirements for each TOW include having experienced professionals (i.e., engineers, architects, surveyors, mappers, transportation planners, right of way acquisition consultants, etc.) on staff that are registered in accordance with state law. International and domestic professional engineering/design firms interested in participating in the project that do not have professionals within their firm currently registered in accordance with state law are strongly encouraged to contact the Florida Board of Professional Engineers at 850-521-0500. In addition, all firms must register to do business in the state. This can be accomplished by contacting the Division of Corporations within the Florida Department of State at 850-245-6051. To learn more about FDOT’s DBE and SBE certification programs, click here. As the I-4 Ultimate project draws closer to groundbreaking and starting our construction operations, SGL Constructors will be providing information on this website about the types of craft and labor positions that may become available as well as specific details for inquiries into employment opportunities. SGL Constructors is currently establishing a Project Employment Office in the downtown Orlando area, and any interested parties will need to visit that office when it opens to express interest in open and available positions. Please check this website for more details in February. SGL Constructors is an Equal Opportunity Employer. The growth of I-4 could directly lead to the growth of Orlando. 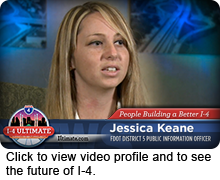 Our local economy can expect a huge boost from I-4 Ultimate. A vibrant economy is directly related to efficient mobility of people, goods and information. In its simplest form, transportation connects producers and consumers, allowing transactions to take place. Orlando is the 26th largest metropolitan area in the United States. Perhaps surprisingly, only 28 percent of the area’s $100 billion gross domestic product is generated through tourism and the 59 million annual visitors flocking to the area from across the globe. Advanced technologies, film and digital media, aviation/aerospace and defense — along with growing life sciences and health care industries — have pushed Orlando to the top of many lists of the best cities for doing business. More than 150 international companies have divisional headquarters and facilities in Orlando. The region is home to 35 post-secondary institutions, including the University of Central Florida, the nation’s second largest university with more than $122 million in annual research. Add in sunny weather and you have a destination city perfectly positioned in the global economy. That equipment on the side of I-4 equals opportunity — every $1 billion spent on highway construction creates more than 28,000 jobs. According to the Federal Highway Administration, the local economy receives $5.70 in economic benefits for every dollar invested in highway construction, a return on investment of more than 500 percent. Highway construction also creates thousands of jobs. Infrastructure jobs accounted for 11 percent of national employment in 2012. Every $1 billion spent on highway and bridge construction creates more than 28,000 employment opportunities. 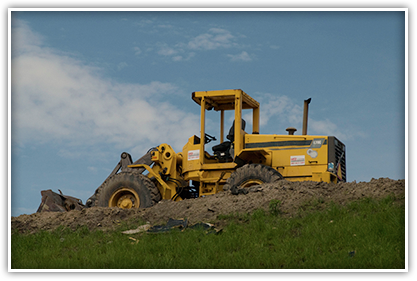 From construction workers to health care administrators and engineers to education professionals, highway construction creates jobs across many industries. I-4 Ultimate brings dramatic changes to Orlando. The $2.3 billion, in year-of-expenditure dollars, project could generate approximately 64,400 new jobs in the Central Florida area and infuse the local economy with more than $13 billion in growth. I-4 Ultimate will create thousands of jobs in Central Florida. 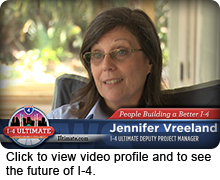 These videos explore the wide variety of people and expertise needed to build a better I-4. New videos are added monthly. 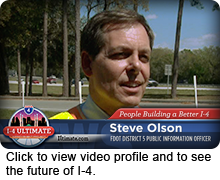 Keep watching to find out more about the real people behind the project and what inspires them to keep Central Florida moving forward. 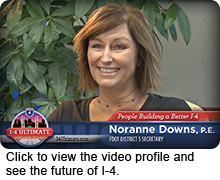 FDOT District Five Secretary Noranne Downs, P.E. talks about her excitement in bringing art and engineering together to create a trademark project for Central Florida. She reminds us that science, technology, engineering and math lead to great career opportunities for women. 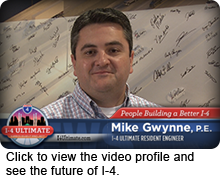 People Building A Better I-4: I-4 Ultimate Resident Engineer Mike Gwynne, P.E. 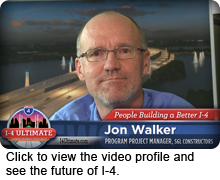 In this installment, I-4 Ultimate Compliance Officer Rodney Renix discusses the transformative nature of I-4 Ultimate and how the project will change the face of Central Florida. 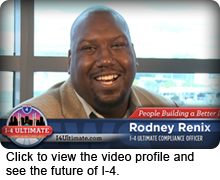 With a passion for creating opportunities for others, Rodney talks about his role in creating partnerships with S/DBEs through ongoing outreach events and local business involvement. 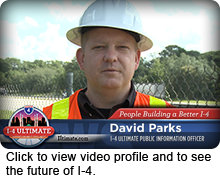 People Building A Better I-4: Florida Department of Transportation District Five Director of Transportation Development Frank O’Dea, P.E. 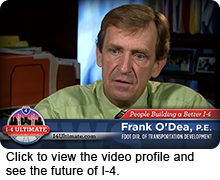 Frank O’Dea, P.E., the District Director of Transportation Development for FDOT, describes how his innate curiosity and adventurous spirit have influenced his career. Frank called upon those traits bringing I-4 Ultimate from concept to reality. 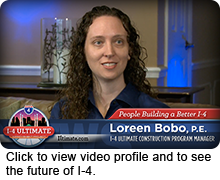 People Building A Better I-4: I-4 Ultimate Construction Program Manager Loreen Bobo, P.E.